The Evason Phuket Resort and Spa is located at Rawai Beach on the south eastern side of Phuket Island. It is set amongst 64 acres of beautifully landscaped tropical gardens, facing the Andaman Sea. Travelling time from the airport is 45 minutes, Phuket town 20 minutes and 25 minutes to Patong Beach (the Nightlife area of Phuket). The Evason Phuket Resort and Spa embodies the Evason philosophy of redefining experiences, and as such presents a refreshing reinterpretation of a five star resort designed to appeal to today's more sophisticated travellers. Guest rooms and suites feature a fresh and unconventional design, which is entirely new for Phuket. 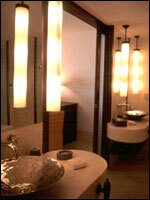 Most rooms have bright, open-style bathrooms so as to create more space and light in the room. A totally new approach to materials, finishes and colours contribute to a refreshing new holiday experience. The resort has 285 elegantly appointed rooms dispersed amongst 5 low rise buildings in a tropical garden setting, including 1 honeymoon villa at Bon Island. More than 80% of guest rooms face the sea with the remainder offering spectacular bay views along the coast line. All standard (Evason) rooms overlook one of the pools and have full sea views. All rooms have either over-sized King or Twin beds with light comfortable duvets rather than the traditional blankets, most with an open-style bathroom and all with private balconies. All rooms have a large day bed designed as a sitting area during the day and easily made up as a third bed at night. - The Evason Pool Villa (Some with private gardens) from 206 sq.m. - The Evason Pool Villa Suite (One Bedroom plus Living Room) from 289 sq.m. - Video CD player & movies available upon request. A comprehensive library of music and movies is available. Evason Resorts have always placed quality dining at an affordable price high on the list of guest facilities, and the resort has a number of options that will appeal to all tastes. Opening hours: 0600 - 1100 hrs. & 1800 - 2300 hrs. Opening hours: 1800 - 2300 hrs. The Evason's newest addition offers unmatched views of the ocean and the surrounding islands from its location next to the water. The restaurant and bar offer a selection of casual fare, including gourmet pizzas and a variety of tapas to enjoy with your drinks. A selection of musicians will entertain you every day of the week. Opening hours: 1130 - 0100 hrs., last order 2230 hrs. A 15-minute boat ride by long-tail boat brings you to Bon Island and its unique scenery, with 140 meters of private beach amid a tropical environment. The cuisine is predominantly Thai served native style, and some popular European dishes plus a BBQ station, all presentation trays to remain as natural as possible. This casual beach restaurant is open for lunch only but can be booked for banqueting functions or special dinners. Opening hours: 0930 - 1700 hrs. Our In Room Dining is available 24 hours, serving a variety of home cooked style dishes as well as TV snacks. We also offer daily specials, which are advised through the order taker. The lobby lounge at the main entrance is a relaxed and quiet seating area, the perfect place to unwind with a freshly brewed coffee, delicious cocktails and canap?s. Here you will also discover our wine cellar with its spectacular selection of wines from around the world or book your wine for dinner at any time of the day or have it delivered to your room. We also host wine tastings (seasonal) in the wine cellar. Our three pool bars offer refreshing drinks and well-known snacks. open from 0900 - 2200 hrs. open from 0900 - 18.00 hrs. open from 0900 - 1800 hrs. A Professionally managed kids' club keeps children entertained all day. The emphasis at Just Kids! is on mind challenging activities, adventure games, and making learning experiences fun. Closely supervised "sleepovers" are arranged nightly to give parents the Resort to themselves. A short 10 minute ride by complimentary hotel shuttle longtail boat will bring you to Bon Island, which is exclusively for the use of the Evason's guests. Bon Island has a pristine white sand beach with crystal clear waters ideal for swimming and snorkeling. The resort maintains full food and beverage services on the island plus showers and changing rooms. - Some are on stilts upto 9 metres high. Our holistic Six Senses Spa goes beyond just a friendly pampering, and provides a truly relaxing and revitalising experience as well as healing treatments. Our luxuriously appointed spa is spread over three floors and sets a new standard in spa design. Facilities include 6 treatment rooms, 2 saunas, 2 steam rooms and a further 3 treatment rooms especially for couples, featuring double baths set in a water environment. An additional 4 treatment rooms are located in salas on the spa terrace facing the Andaman Sea. A comprehensive selection of event rooms and areas provide an ideal location for meetings and incentive groups of varying sizes. The Sixth Sense - the largest indoor space of 432 square meters, accommodates up to 480 in theatre style or for cocktails. For an intimate board-room set up to a themed banquet, the Evason Phuket Resort & Spa has the ideal air-conditioned environment.